Not only that, but I have a strong desire to speak the language. I want to be able to have small talk with the Späti owner across the street or make the old lady at the bus stop laugh when we are crouching for shelter from the rain. I want to be able to argue with o2 on the phone when my internet goes out or ask my boyfriend’s grandmother to tell me embarrassing stories about him as a child. I want to be able to understand the letters I get from my health insurance company without having to type the whole damn thing into Google translate (or sending a screenshot to my boyfriend, “can you please tell me if I owe anything? DANKE SCHATZI). Learning a language as an adult is hard (especially when that language is one of philosophers and thinkers). I have no idea why learning languages is easier for some people. 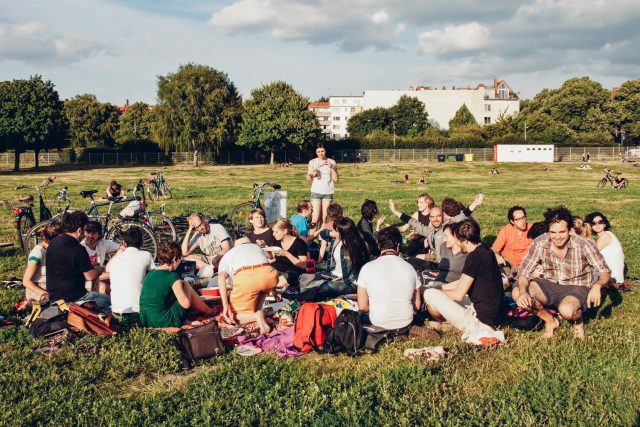 All I do know is that Berlin has LOTS of alternative language learning classes/meetups to choose from if the traditional textbook + classroom formula just isn’t working for you. I’ve been in and out of these “traditional” schools for 3 years, and couldn’t seem to find one that fit my interactive learning style. 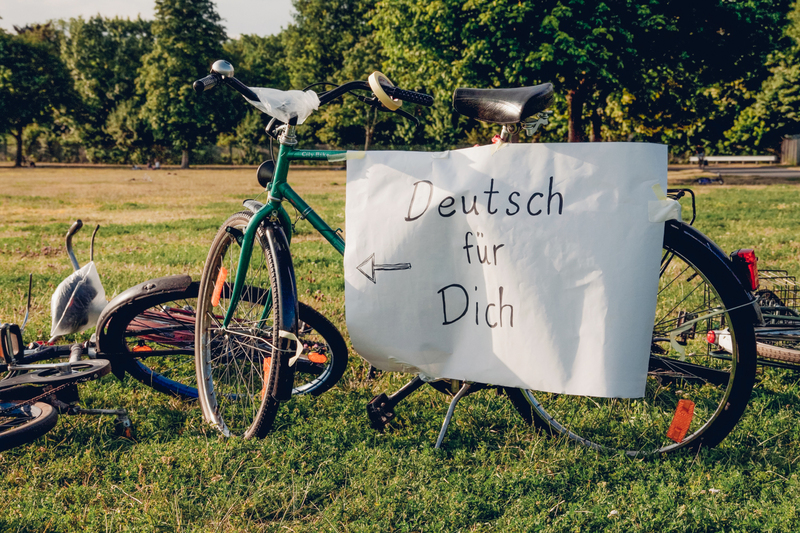 If you’re like me and you get bored in the traditional classroom setting, here are several alternative language learning options that will make learning German fun again. Perks? Deutsch for Dich is run by a group of nice and friendly teachers who are passionate about the German language. They teach five open German classes weekly and have three different levels for your convenience. The dim lighting and cozy setting help alleviate any anxiety you might feel when attempting to practice your German skills. Also, it’s a bar..so there’s beer! My 2 cents: Though you probably won’t master the language here, the informal atmosphere provides a safe space for you to get your Fuß nass. Perks? 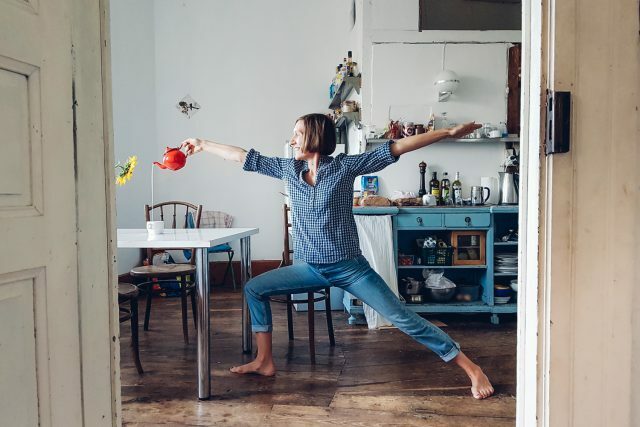 If you’re like me and you feel a panic attack coming on whenever it’s time to speak German, you’ll likely benefit from this relaxing yoga session that doubles as a German lesson. For the first 20 minutes of the class, the instructor provides a short exercise for the class to complete altogether. When I attended, each student had to pull information from an image of an apartment building and construct a grammatically correct sentence. She then proceeded to teach us a yoga class in English (repeating each step in German as well.) It didn’t take long for me to start recognizing important vocabulary like einatmen (breathe in), ausatmen (breathe out). My two cents: Great for apprehensive beginners and zen masters alike. Perks? Peter Merrick teaches a German class for “Pattern Hunters”. Though the class is taught in a traditional classroom setting, it’s anything but traditional. 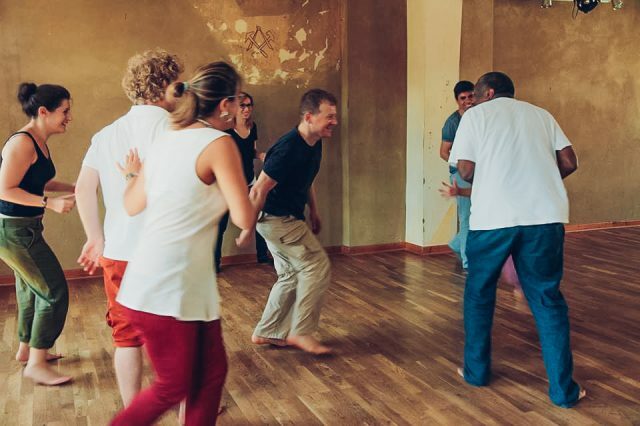 The class is divided into three modules over the course of three months and unlike all the other traditional schools located in Berlin, the first two modules are taught in English. In the first two months, Peter covers the bulk of German grammar, how to “hack the German case system” and how to make mind maps. In essence, he teaches you HOW to learn, not just WHAT to learn. The last module is heavily based on writing personal stories and then reciting them out loud to the class. My 2 cents: The small class size and emphasis on pattern hunting makes this class both enjoyable and effective. This class is definitely worth your time! Oh, and he also has a class called German for Mums which allows moms (or dads!) to bring their kids to the German lessons. 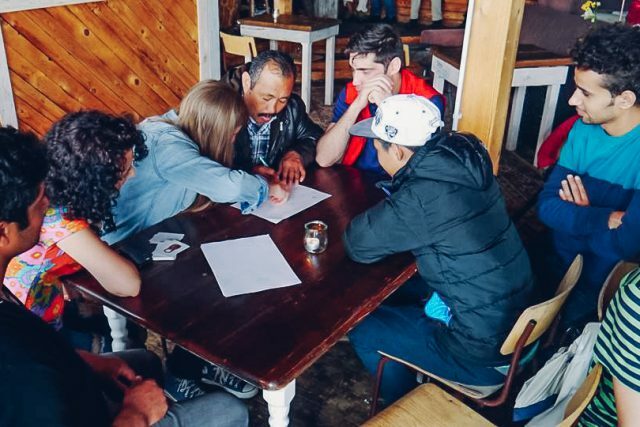 Perks: You can practice and improve your German in a fun and playful way by improvising scenes with other German novices. The class is ideal for anyone who is tired of being taught from a boring textbook or who might be preparing for an upcoming verbal exam. Build your confidence in a fun and inviting atmosphere. Bonus, the first class is free! My 2 cents: ‘Fun’ and ‘playful’ aren’t usually words associated with learning German. But it doesn’t have to be that way! My 2 cents: Think of all the Sternis you’ll be able to buy with all the money you save on traditional German classes. PROST! Nicole Paulus is a millennial expat from the States. When she’s not dancing at Kater, drinking beers at Tempelhof, or eating shawarma at Maroush, she’s busy running her own digital marketing company Nico New Media. You can read about her adventures on her blog. I am the Organiser of the group. It is the most active German practice group in Berlin and in Germany as a whole. It is free for everyone. No cost and no donation asked, just come by and have fun. We meet 5 days a week which gives pretty much everyone the chance to join us at least once a week. Our group is almost 2 years old and at good days we have more than 100 people attending. Like the last summers, we will most likely go out for a huge picnic again on weekends. I liked the idea you have shared of learning German through Yoga. It is something innovative and sounds very relaxing option too. The picture you have shared here is also relevant to the content. Keep sharing such innovative posts to help German learners. Theater games sounds like yet another innovative idea one might consider.